A special Thank you to Simon and Schuster for sending me this book to review. I was immediately in love with this book because of it’s cover. It drew me in, I’m not gonna lie. What a stunning piece of artwork. You know the old adage – don’t judge a book… blah, blah, blah. Well I did. And it paid off! I had a hard time putting this book down. And I love that this book was set in Park City, Utah, and it obviously had some religious undertones, but they were very, very light and not solidly Mormon/LDS. This book will go over well with a wide range of audiences of diverse faiths, having a moral center, yet not preaching religion. Brodi Ashton’s debut work is captivating, well-constructed and a pleasure to read. Her characters are beautifully crafted and engaging, and the storyline is unique and believable. I can’t wait for the sequel! I'm a cover lover, and this cover is gorgeous! Isn't it?! I was sent a paperback advanced copy, and let me tell you, the cover feels like the softest velvet. Seriously! It feels like velvet! This is probably the most beautiful cover I've seen in a long time! I was immediately drawn in to this story. I pretty much don't know anything about Greek mythology. Anything I did know, I lost after I graduated high school. Have no fear though, author Brodi Ashton explains anything you'll need to know to understand the story. This is probably the most creative book I've read in a very long time. I loved the modern re-telling of Persephone! I seriously had NO idea how this book was going to end. It could go so many ways, I kept forming several possible scenarios as to what was going to happen next. I was always surprised. I felt emotional through this book. It almost feels like this is what one would feel if they were suicidal. Trapped. Just wanting the pain to go away. If there was a way, they'd take it. No matter the consequences. I was full of emotion. I just wanted Nikki to be happy. I wanted her to stop hurting, and have the life she wanted. 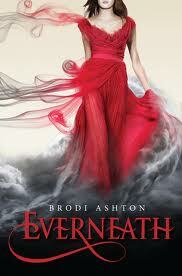 Bravo to author Brodi Ashton. Her debut novel is a work of art! I know you'll love it as much as I do! Agree! This was one of my favorite reads! I can't wait for the release so I can buy a copy...and I am lucky enough to live close by and to kinda know Brodi, so I can't wait for her book launch! It is great to see a new author with so much promise! Looks FAB, and we ALL judge a book by its cover . . .
@Aubrey Famous by association eh?! Jealous! You'll love the feel of the book! I like having it on my shelf now, it's just so pretty! @Jolene Whoever says they don't judge a book by it's cover is lying! The cover makes ALL the difference. It is my first impression if I even read the summary or not.